Hobgoblins are by far the most sinister and devious of the Night Children, possessing a sharp, cunning intellect to rival that of mankind. They commonly employ ranged weapons, such as bows, and many display knowledge of spellcraft — traits unique among least demons. Because of this wit, hobgoblins are frequently encountered as leaders among large groups of goblins and orcs; on rare occasions even the mostly solitary bugbears and trolls can be found serving hobgoblin masters. Hobgoblins are also the only Night Children that actively seek out and summon their demonic superiors. Some sages believe that all of these traits, taken as a whole, suggest that hobgoblins are the larval stage in an unfathomably long and hideously alien lifecycle that culminates in the ascension of a demon prince. Hobgoblin Warrior: Init +2; Atk sword +d4+1 deed melee (1d8+1) or bow +d4 deed missile (1d6); AC 15 (chain mail); HD 2d8+2; MV 30′; Act 1d20; SP infravision 60′, -1 attack in bright light, mighty deed of arms, vulnerable to fire; SV Fort +1, Ref +2, Will +0; AL C.
Mighty Deed of Arms: Hobgoblin warriors have a d4 deed die (at least) and are capable of performing deeds as members of the warrior class. Vulnerable to Fire: Hobgoblins take an additional 1d6 damage from fire, and have a 50% chance of catching fire whenever they take damage. Hobgoblin Warlock: Init +1; Atk balefire missile +3 (1d12); AC 10; HD 2d6+2; MV 30′; Act 1d20; SP infravision 60′, -1 attack in bright light, spellcasting, summon balefire, vulnerable to fire; SV Fort +0, Ref +1, Will +2; AL C.
Spellcasting: Hobgoblin warlocks may know wizard spells as high as 3rd level. They have a bonus to spell checks equal to HD+1. Summon Balefire: Hobgoblin warlocks can summon and hurl orbs of sickly green flame called balefire. Though it appears as fire, balefire is deathly cold and does no damage to demons of any sort (Night Children included). In addition to attacking with balefire, warlocks can make a spell check against DC 14 to transform all natural flame in a 30′ radius into balefire. I’ve got mad love for frog-men; I know I’m not alone in this, both Wampus Country and the HMS Apollyon feature notable frog-man races. Much like the rat-men I’ve previously covered, frog-men as a traditional fantasy gaming adversary have roots in British game publishing (though the credits actually indicate Luke and Gary Gygax created the race). I like to use them in classic chaotic humanoid mode, generally filling the niche of a rival faction in swamps otherwise dominated by lizard-men or rat-men. I’m sure I’m not the first person to take a crack at statting them for DCC — Attack of the Frawgs certainly must have done so, and also I haven’t picked up Critters, Creatures, & Denizens which might have covered them as well. I got the inspiration to use a deed die for one of their abilities from Sepulcher of the Mountain God (which I’m running a slightly modded version of this weekend). I think it’s a neat alternative to low-DC saving throws for special abilities on low-level monsters. Frog-Man: Init +0; Atk bite +1 melee (1d4), tongue +1d3 deed melee (1d3), or as weapon +1 melee; AC 13 + armor; HD 1d8; MV 15′, Jump 30′, Swim 30′; Act 1d20; SP camouflage, hop attack, tongue; SV Fort +0, Ref +2, Will -1; AL C.
Camouflage: Frog-men easily blend into their swampy environment and always have at least a 20% chance to surprise even characters actively on the watch for them. Against less vigilant or swamp-savvy adventurers the chance of surprise is 50%. Hop attack: After jumping at least 15′ into an attack using a piercing weapon, frog-men gain +1D to hit and score a critical on a natural 22-24. Tongue: Frog-men use their powerful tongues in combat against foes in melee range. In addition to bludgeoning damage, frog-men roll a d3 deed die when attacking with their tongue. A frog-man may attempt to either disarm or trip the opponent on a successful deed roll (per DCC RPG pgs. 89-90). I did this once before as a d30 table, but that was clearly not a diverse enough set of options. Roll d100 for each column; there’s a 50% chance that the gender form of any title is inverted. In Tuesday’s post, I made a few references to orcs being organized into evil armies by chaotic wizards. There is probably nothing in role-playing less in need of mechanical support than how a villainous wizard gathers an army of orcs. You want a bad wizard, you make a bad wizard; you want him to have orcs, he has orcs. The only time you could possibly have even the most remote need for a system to support this is if that foul mage is one of the player characters. But why shouldn’t she be? We’ve had spells in D&D for a long, long time implying that other party members wouldn’t automatically turn on the wizard if he raises a few undead servants. Isn’t it equally possible that the party might be willing to put up with a little orcish brutality if it gives them a few more meatshields? So just in case that comes up, here’s a 5th level wizard spell for DCC RPG. I don’t know if this is really balanced with other 5th level spells, but hey, orc army! General: The caster calls a band of orcs to serve his sinister plans. The orcs summoned will serve the wizard until they die or until their master suffers a decisive defeat in battle (judge’s discretion). However, the wizard must set the orcs about some task that shows the promise of regular bloodshed and savagery. To cast the spell, the wizard must have a permanent dwelling worth at least 10,000 gp. Once successfully cast, the wizard must be at the dwelling when the orcs arrive or they will wander off. The wizard need not wait around for new orcs if he already has orcish servants residing in the area around the dwelling. The orcs that arrive will be equipped with the equivalent of leather armor and a long sword. Neutral wizards suffer a -4 spell check penalty when attempting to cast this spell; lawful wizards cannot cast it at all. If the wizard’s patron is strongly associated with orcs, they gain a +4 spell check bonus. A +1 spell check bonus is gained for every full 100 orcs already under the wizard’s command as the strengthening horde attracts ever more minions. Manifestation: Roll 1d3: (1) The area around the dwelling grows foul, as foliage falls from dying trees and water becomes brackish; (2) A sigil of balefire appears in the sky above the dwelling; (3) Thunder clouds darken the sky above the dwelling, rumbling and crackling with lightning and dropping acid rain. Corruption: Roll 1d6: (1) The caster’s nose transforms into a pig-like snout; (2) The caster grows boar-like tusks that just out from his lower jaw; (3) The caster’s skin takes on a sickly green-gray palot; (4) The caster permanently loses 1d4 Intelligence and begins to speak in simpler, cruder manner; (5) The caster develops a strong craving for raw meat, and will eat it at every opportunity; (6) The caster’s develops an aversion to bright light, suffering a -1 to all actions in direct sunlight. 1: Lost, failure, and worse! Roll on the corruption table. 2-11: Failure, spell is lost for one month. 12-15: Failure, spell is lost for one week. 16-17: Failure, but spell is not lost. 18-19: The wizard summons CL in orcs. They arrive in 1d3 weeks. 20-23: The wizard summons 1d3 x CL in orcs. They arrive in 1d3 weeks. 24-25: The wizards summons 2d3 x CL in orcs. They arrive in 1d3 weeks. 26-28: The wizard summons 2d3 x CL in orcs, one of which will have 3d8 HD, along with 2d3 dire wold mounts. They arrive in 1d5 weeks. 29-33: The wizard summons 2d3 x CL in orcs with 2d3 dire wolf mounts; one orc will have 5d8 HD. They arrive in 1d5 weeks. 34-35: The wizard summons 2d6 x CL in orcs with 2d8 dire wolf mounts. One orc will have 5d8 HD, and another will have 3d8 HD. They arrive over the course of 1d6 weeks. 36-37: The wizard summons 2d12 x CL in orcs along with 1d10 x CL dire wolf mounts (there cannot be more wolves than orcs, however). One orc will have 5d8 HD, and two will have 3d8 HD. They arrive over the course of 1d6 weeks. 38+: An orcish horde of 2d16 x CL orcs are drawn to the wizard, along with 2d10 x CL dire wolves (again, no more wolves than orcs). One orc will have 5d8 HD, and four will have 3d8. They arrive over the course of 1d6 weeks. After the swarming masses of goblins, orcs are the second most numerous and commonly-encountered breed of Night Children. Though all least demons are prone to mutation and malformation, the physiognomic diversity displayed by orcs is staggering. In fact, some sages with a particularly keen interest in styxozoology have suggested that rather than the five commonly accepted varieties of Night Children (goblins, hobgoblins, orcs, bugbears, and trolls), there are in actuality hundreds of different breeds, and that it is only through uneducated and ill-informed peasant tradition that all brutish warrior-types have come to be collectively categorized as orcs. To date, however, field research has proved too formidable and mortiferous to conclusively support this thesis. Whatever physical characteristics they display, there are a few traits common to all orcs: They are strong, dim-witted, and voracious. On their own, orcs deploy little-to-no strategy in their attacks, rarely even showing enough tactical accumen to utilize ranged weapons. Under the command of clever hobgoblins or sinister mages, however, orcs can easily transform into a terrifyingly adept army; they even seem to spontaneously gain great skill at weapon and armor craft in such circumstances, only to lose the ability to construct all but the crudest armaments if the leader is removed. Unlike goblins, many orcs are capable of crudely speaking the languages of men despite their lack of intellect. Orcs have no capacity for magic of any sort. Perhaps the most frightening characteristic of orcs is their unholy hunger. Even in the midst of battle, orcs will often disregard immediate danger to gorge upon the entrails of a fallen foe before resuming their assault. This demonic appetite causes orcs to exude an aura of dread, which is why even a well-armed force of common men will falter and flea at the sight of an orcish warband. Orc: Init +1; Atk* bite +1 melee (1d4) or as weapon +1 melee; AC 11 + armor; HD 1d8+1*; MV 30′; Act 1d20; SP infravision 60′, -1 attack in bright light, lesser fear, unholy hunger, vulnerable to fire; SV Fort +2*, Ref +0, Will -1; AL C.
*Orcs can vary wildly in size; these stats represent a roughly man-sized orc. Particularly large orcs will have an additional +1 to hit and damage in melee, to hit points, and to Fortitude saves. Likewise, particularly small orcs (about the size of a dwarf) receive a -1 to the same traits. Lesser Fear: Whenever henchmen, hirelings, or other 0-level NPCs encounter orcs, they must make a morale check against DC 11 or attempt to flee. If the orcs have been organized under an intelligent leader such as a hobgoblin or wizard, the DC increases to 13. Unholy Hunger: If an orc is in the vicinity of a fallen and helpless foe, they must make a Will save (DC 11) to take any action other than ripping open the enemy’s gut and devouring a few handfuls of organs before returning to combat. The orc suffers a -1 penalty to AC during the round it spends stuffing its gullet. Once a foe has been gutted it no longer poses a temptation to other orcs. Vulnerable to Fire: Orcs take an additional 1d6 damage from fire, and have a 50% chance of catching fire whenever they take damage. Rat-men priests have the same stats as standard rat-men with the addition of the following magical abilities. They often use maces instead of short swords. Blessing of the Plague Demon: Once per day, the priest can grant a blessing to all rat-men in a 30′ radius. The blessing lasts 1d4 rounds and provides +2 damage and a +2 bonus to the DC to resist rat-men’s disease (making the DC 14). Choking Cloud: Rat-men priests can cast this spell with a +3 spell check bonus. Summon Rats (3/day): The priest can cast a spell that brings forth either 1 rat swarm or 1d3 giant rats. That rats will emerge from the earth within 30′ of the caster; a swarm can be directed to emerge in a 20′ x 20′ space already occupied by the rat-men’s foes. Sure, there are the big bads everyone knows — Orcus, Demogorgon, Asmodeus — but sometimes a lesser-known hellish bureaucrat is called for. Here’s a random table to help with those occasions. Roll 1d30 for each column to determine the fiend’s rank and sphere of influence. There’s a 50% chance that a demon is depicted as female, and the title’s form should be changed accordingly. Doing another DCC monster update, this time to the rat-men. 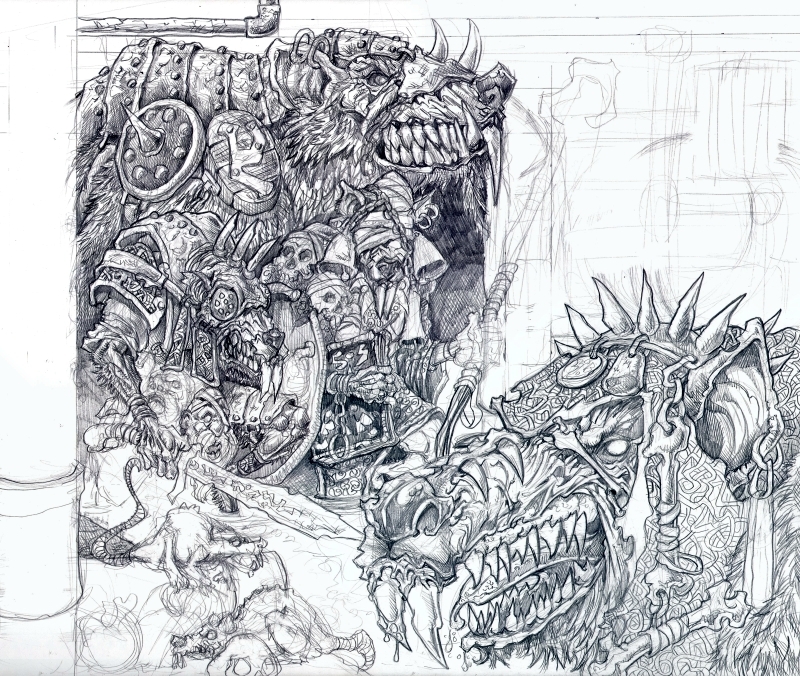 Despite all of the drastic changes in world during the intervening epochs, in the Age of the Sixth Ruination rat-men continue to thrive, infesting sewer, swamp, and dungeon alike. Init +1; Atk bite +0 melee (1d4) or short sword +0 melee (1d6); AC 12 (ragged armor); HD 1d8; MV 40′, Swim 20′; Act 1d20; SP disease, infravision 60′, sneak silently +2; SV Fort +1, Ref +2, Will -1; AL N.
Disease: Every time a character takes damage from a rat-man’s bite, or from a weapon that the rat-man has coated with filth, they must make a Fortitude save vs. DC 12. Failure indicates that the character has been infected with some disease, generally coughing spasms or something similar. The PC suffers -1 Stamina for every such failed save, though the effect has a delayed onset of one turn after the end of combat. Sneak Silently: Per the Thief class ability. Here is my pre-play take on the DCC stats for goblins of the Night Children variety. While I should hesitate to stat up monsters for a game I haven’t technically played, I have played plenty of D&D in my day, both 2E and 3.xE. Plus, these are pretty much just the goblin stats from the book with a couple extra abilities added. Swarm: If at least 3 goblins are in melee with an adversary of human size or larger, they can attempt to swarm the target. The goblins make a grapple check against the target with a bonus equal to +1 for every goblin involved. The opponent reduces any size bonus by -4, so a human target gets no bonus for being larger than the goblins. If the goblins win they swarm the opponent, stabbing, biting, and clawing; this inflicts 1d4 damage per goblin. The opponent is also pinned. If the pinned creature succeeds in their grapple check on subsequent rounds, they manage to remove 1 goblin for every 5 points (or fraction thereof) by which they beat the goblins’ roll. Vulnerable to Fire: Goblins take an additional 1d6 damage from fire, and have a 50% chance of catching fire whenever they take damage. One of the most common threats faced by adventurers in the Age of Ruins are rat-men. Before Iso Kharu’s Wrath, any city of substantial size had at least a small colony dwelling in its drainage system, and their numbers have only increased since the cities were reduced to ruins. The byzantine sewers of Atgur house a population of rat-men large enough to constitute a city of their own. It is common knowledge that the Atgur Brutal swamp is the birthplace of the rat-men, but there are conflicting legends as to how they came to be. Many learned sages believe that in the deepest reaches of the swamp lie pathways to the domain of Bayemon (Padishah of Poxes, He of 1,000 Boils), a demon prince of disease. Some speculate that common rats wandered down these pathways into “the swamp that is not the swamp” and fed upon the flesh of the demon prince, becoming the first rat-men. Whether that is true or not, the rat-men certainly seem to venerate Bayemon along with other demons and devils associate with pestilence and plague. Disease: If a rat-man wounds a character with a bite or with a filth-coated weapon, the character must make a Vigor roll. If they fail, the victim gains a level of Fatigue as they are racked with coughing spasms lasting 2d6 days. Characters who become Incapacitated from this Fatigue struggle to breath as phlegm fills their lungs. Low-Light Vision: Rat-men have keen eyes and halve the penalties for darkness. Shaman: Rat-men shamans have Spellcasting d8. They generally know Boost Sneak, Lower Vigor, Fear, and Quickness. If using power points, they have 15.